Tropes about newborns and toddlers. Sub-index to Youngsters. See also Family Tropes, Pregnancy Tropes, Birth Tropes. See also Badly Battered Babysitter. Babies Ever After: The work ends when the main couple have kids. Wedding-Enhanced Fertility: A woman has an unintentional but welcome pregnancy just before or just after her wedding. Babies Make Everything Better: Babies solve all problems. Baby Boomers: Hiding a bomb in a baby carriage. Baby Carriage: During a car chase scene, a baby carriage gets into the way of the cars. Baby-Doll Baby: Treating a baby doll like your actual son or daughter. Baby Language: Babies have their own language. Baby Morph Episode: A character is turned into a baby. Baby See Baby Do: A baby copies someone. Baby's First Words: A baby's first words can be heartwarming or hilarious. Baby Talk: A character can talk, but is too young to do so properly so they sound "wike dis". The Baby Trap: Someone in a relationship deliberately causes a pregnancy without their partner's consent, in order to bind their partner to them. Badass and Baby: Someone beats up bad guys while holding baby. May or may not be their own. Bizarre Baby Boom: Something happens to the world which causes people's kids to develop powers. A Boy, a Girl, and a Baby Family: A family that consists of parents and three kids: a baby and two older siblings who are a boy and a girl. Brainy Baby: A genius who is a baby. Breeding Cult: An attempt to breed a Chosen One or Master Race. Brought Home the Wrong Kid: A neglectful babysitter or parent takes the child out somewhere and brings home the wrong child. Child Eater: A character eats children specifically. Child of Forbidden Love: Child of Star-Crossed Lovers. Chocolate Baby: A baby doesn't look anything like either of their parents. Delivery Stork: Babies are delivered to their parents by a stork. Designer Babies: Alterning a fetus so the baby will be "perfect". The Diaper Change: Someone changes a diaper. Diaper Check: Checking to see if a baby needs to be changed. Doorstop Baby: Someone leaves a baby on the doorstep of people who end up adopting the baby. Eats Babies: A character is so evil they sometimes eat babies. Egg Sitting: Often a test given in High Schools to see how well students would do at parenting babies. Evil-Detecting Baby: A baby that can sense evil. Fake Pregnancy: A female character lies that she is pregnant. Fearless Infant: Babies never get scared. Fountain of Youth: Circumstances cause a character to become much younger than their regular age. Sometimes but not always has the character become an infant. Getting the Baby to Sleep: A character does something weird to try and make the baby stop crying and/or fall asleep. Give the Baby a Father: A pregnant woman marries a different man so that she won't have to raise the baby alone. Goo Goo Godlike: All-powerful babies and toddlers. I Want Grandkids: One or both parents demand grandchildren from their adult children. Improvised Diaper: Diapering a baby with something that's not a diaper. Invasion of the Baby Snatchers: Kidnapping children. Last-Minute Baby Naming: Waiting until the baby is born before naming him/her. Let's Have Another Baby: One of a married couple says that they want another child, which usually leads to someone dying, them breaking up or them failing to have the baby. However, happy examples do count. Miss Conception: Someone who doesn't know where babies come from. Moses in the Bulrushes: A baby is abandoned by their biological parents and is found and adopted by others. No Infantile Amnesia: A character can remember their babyhood. Politicians Kiss Babies: Politicians kissing the babies of potential voters (who are usually female). Screaming Plane Baby: Infants crying on public transportation. Shotgun Wedding: A baby's conception is the reason why a couple got married in the first place. Siblings Wanted: A child asks their parents for a sibling. Spinoff Babies: A spinoff of the show where the main characters are younger. Straying Baby: A baby crawls off into danger. Super Breeding Program: Breeding "better" people. Three-Month-Old Newborn: Older babies playing newborns or newborns who look and/or act older. Tinkle in the Eye: A baby pees on someone. 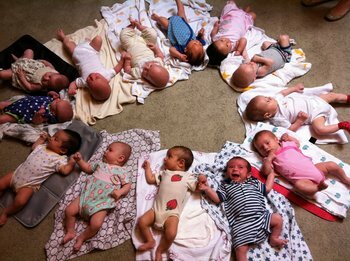 Too Many Babies: A woman gives birth to too many babies. Uterine Replicator: Growing a baby in a machine instead of a womb. Wave of Babies: An actual wave of babies. Yet Another Baby Panda: Animal videos on the news.